the moment i saw the Sony Cybershot T2, i super fell in love with it na! imagine, 8.1 megapixels plus a 4GB internal memory! hay, i've always wanted to buy it but i wasn't able to raise enough cash for it. it started at around Php 25k-30K din ata about dec '07 pa. but just last month, i saw it in Php 15k na sa malls so i've decided to buy one kanina using my dad's credit card, but noooo!!! it's not available anymore 'coz it's phased out na raw. argh. sony releases new series daw kasi every 6 months, so those i've seen last month were probably the last few stocks available nalang. so i tried to let it go na. 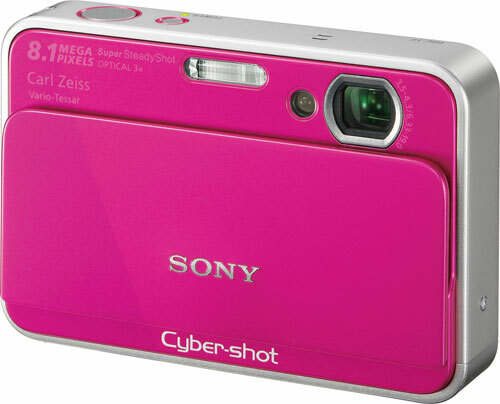 then in my search for digicams, i saw the new Cybershot T series released by Sony just last month. gosh, i think i got even more confused with what to buy na. haha! the new T series is a whole lot better! and can i just say...a whole lot expensive! well, of course, Sony's prices are always high on the 1st few months of the product in the market, but great price drops are effective on the last few months before they release a new series. so here's what got my attention at first. it was offered to me by several salesmen. it's the Sony Cybershot DSC-T77. it's not available in hot pink. but what i really love about this is it's 10.1 megapixels and it's so thin, just 15mm and has 3" wide touch screen. plus, it has paint and slideshow w/ music function. it costs Php 25,999 and where will i get cash that much? if i'll use credit card and pay it for 12 months, gawd, it will cost me more than Php 2K a month. well it's ok for me but i don't like the fact that when time comes that this cam's price drops, i'll still be paying its price when it first entered the market. i think it won't be sulit because those who will get this cam after a few months will pay cheaper nalang as compared to what i'll be paying if i'll get it now. so i thought, i was already decided that i'll just wait a few months before i buy this cam. but no!!! one of the salesman has mentioned about Sony Cybershot DSC T700, and it confused me even more! huhu. so when i got home, i did a reasearch about it. it's actually the evolution of T2. it also has a built-in 4GB memory w/ expandable memory card slot. from 8 MP, it evolved into 10.1 MP! and it's even thinner than T2, just 16.4mm. it's also better than T77 since it has 3.5" wide touch screen! gawd i soo love it even more! but hello, the price is Php 30,999. again, where will i get that much?!? it will cost me almost Php 2600 every month in a year! and again, i don't wanna buy it in its most expensive price because i know its price will drop eventually, if only i could wait patiently. haha! but then, i saw an online store selling all the Sony Cybershot cameras for super cheaper prices! it even includes a 2GB memory stick! look at this. this is how much cheaper it will cost me if i'll buy a cam in cash, from the online store. DSC-T77: Php 18,500 (mall price: P26K) --> hello, super big price difference! DSC-T700: Php 22,500 (mall price: P31K) --> even bigger price difference! hmm so i think, i'll be getting a T700 na. but i still have to save more. i think i'll be able to buy it after Christmas pa. hopefully, the online store won't run out of stocks of this model, or else, i will be super depressed na talaga! huhu. and hopefully, mall price drops na so i can use credit card as another option if i can't raise enough cash. hmm but i hope the prices from the online store drops also. haha! waaah i really want it na! i want to have it before everyone around me gets to have one. haha!